Hello Fellow Candy Lovers! So, being in the candy industry, we are surrounded by many creative ideas for weddings, events, and parties. As everyone knows, the new trend is to have a candy buffet bar at your wedding or event. Candy buffet bars can range from fun and festive to elegant and classy. The possibilities for this new fad seem endless as it has become an artistic centerpiece, and we're always excited to see what our customers come up with. [caption id="attachment_146" align="alignleft" width="300"] Meant to Bee by Bridal Gown Blog Spot[/caption] We have one particular customer that has created an idea so adorable that we really want to share it with all of our customers also. Her blog is full of many fun, creative ideas, but we were particularly impressed with her "Meant to Bee" theme--her posts for this begin on September 29, 2011. We recommend reading through her blog for other fun, cost effective ideas. Bridal Gown Blogspot showcases many creative ideas and she is constantly having special giveaways for her followers--so get involved, and get inspired. 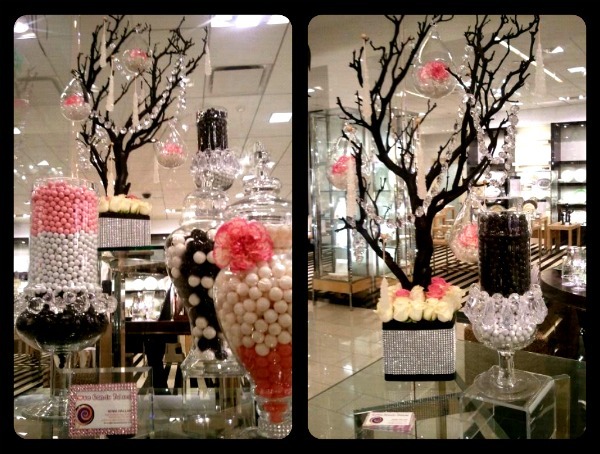 :) [caption id="attachment_145" align="alignleft" width="300"] Bloomingdale's Candy Display by Love Candy Tables[/caption] We also want to congratulate Love Candy Tables for being featured in Bloomingdale's at Fashion Valley in San Diego, CA. We remember the day she was in our warehouse selecting the candy for her Bloomingdale's candy display with so much excitement. She has also been featured on MTV's Quiero Mis Quince. We love being involved in the process, and want to make sure to recognize our customer's talents and achievements. Love Candy Tables creative designer, Nema Hallak, has a brilliant eye for creating beautiful candy displays--we recommend visiting her website and contacting her for a free quote! Just for stopping by our blog, we want to offer you 5% off of your next candy order of $100 or more with www.candypros.com. Use Coupon code "blog5" at checkout.